Home Apple iPad iPhone Which Apple Device is Right For You ? Which Apple Device is Right For You ? The iPhone is Apple's flagship iOS device. More than just a phone, it is a connectivity tool that lets you access the web, download and play music through the built-in iPod app, capture and store images, and customize its usability through an enormous number of third-party apps available through Apple's App Store. The iPhone was the first device to mass-popularize multi-touch screen controls on mobile devices. The cost of the iPhone is usually subsidized by wireless carriers in exchange for 2-year service contracts. The "magical" iPad created a new category of mobile device that fits in between a smartphone and a laptop. It runs on iOS, the same operating system as the iPhone. Many apps in the App Store work universally on the iPad and iPhone. The original iPad was created to optimize the experience of web browsing, playing games, and reading online content. Since its launch, many iPad-specific publications and apps have been created to take full advantage of the iPad's bigger screen and multi-touch interface. Some would say that in its simplest form, Apple's iPod touch is an iPhone without phone service. The latest iPod touch generation does offer many of the same features as the iPhone, including Face Time video calling, a retina display, HD video recording and editing, web browsing, the ability to store and play music, and much more. 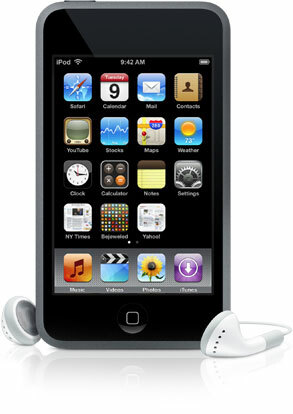 Apps made for the iPhone will work on the iPod touch, with the exception of the ones that require phone service. 1. Handling calls and voice messages. Includes Visual Voicemail, Voice Control, and the ability to merge calls and manage contacts. 2. Listening to music and watching videos. 4. Getting directions through the built-in Maps app. 5. Sending and receiving messages, such as email or texts. 6. Staying productive with the aid of third-party apps. 1.Web browsing and reading online content. 2. Playing games and creating music. 4. Writing, editing, and managing content such as presentations, spreadsheets, and text documents. 5.Viewing and editing images and video. 2.Watching movies and listening to music. 3.Video messaging with Face Time and text messaging with the (help of third-party apps). iPod touch also has two cameras).